Two years ago, I wrote about lussekatter, the traditional buns for St. Lucia Day (Dec. 13), at the Swedish bakery up in Andersonville. This year I decided to try making them. As I said in the linked thread, we did not observe the St Lucia tradition in my family, so I’m just going by the bakery version and the cookbook descriptions. 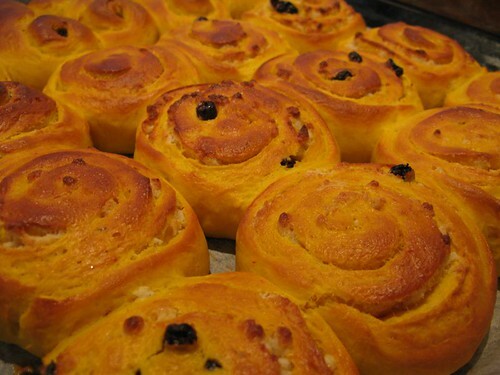 The name of these buns translates as “Lucia cats”, with each cookbook giving a different and probably unfounded story about why. (Hello, Bridgestone, do you know the real story here?) 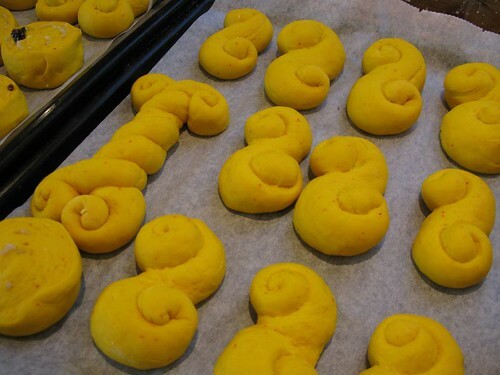 The buns get shaped into various kinds of curlicues. 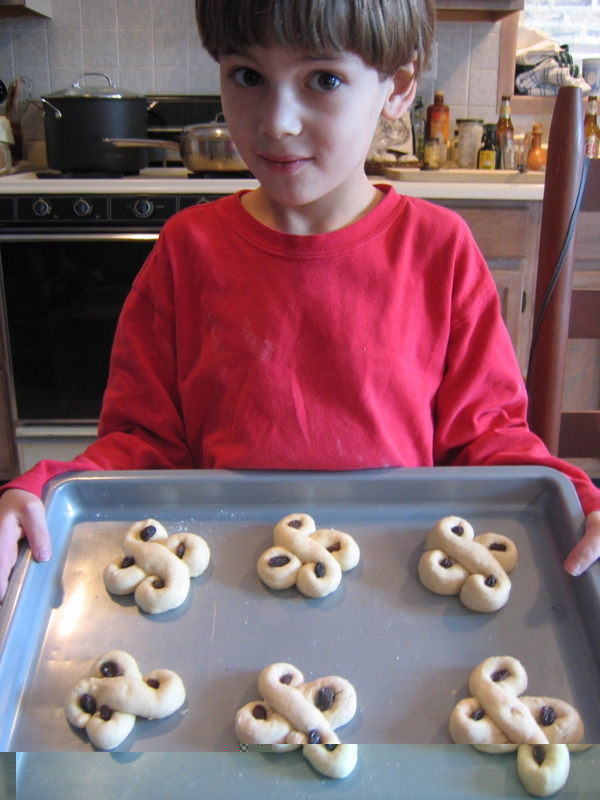 Lucantonius helped me make ours into crosses, with a raisin in the center of each curved arm. I made half the batch flavored with saffron and half flavored with cardamom. An egg wash gave the buns a nice color. They came out bigger and softer than the tight S-shapes at the Swedish Bakery, but I liked the rich dough and especially the cardamom flavor. 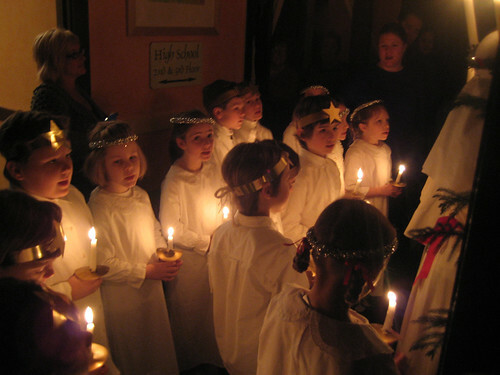 Happy St. Lucia Day on Wednesday to you all! Those look like they’d be good with a cup of strong joe or aquavit. I'm sorry to say, I don't think I've ever had these little buns. I was hoping to chomp a few at the Tre Kroner julbord, but owner Patti Rasussen told me that she makes them only for the "official" St. Lucia celebration this coming Wednesday. To hear her tell it, it seemed like a lot of work...but then again, you apparently had a helpful alfer to ease the burden. I was thinking of making them in the shape of a Viking bryntröll, but this might be easier. Or at least less threatening. How could I resist an invitation from Amata?! I've always believed myself that "Lussekatter" means "Lucia cats" and, from there, convinced myself that the name refers to curled "S"-shape's (forced?) similarity to a sitting cat's. However, I've found another explanation after a little Internet searching that I think I prefer. 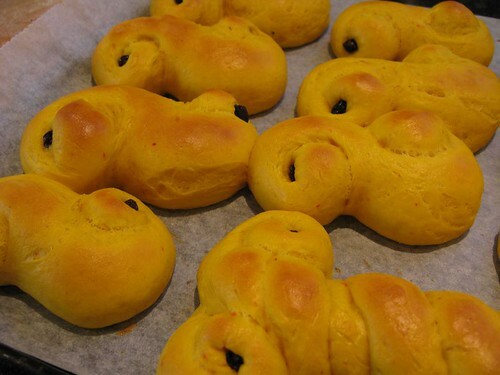 "Lussekatter" looks a lot like "lusse_katter" which would translate to "lusse cats". "Lusse" seems close enought to "Lucia" to make everything dandy. However, one can also interpret: "lus_s(e)katter" from the word. "Skatt" means "treasure" in Swedish. "Lus" can now be intrepreted as “Lux” (the same latin root meaning "light" found in both "Lucia" and "Lucifer") and, after a few more leaps in grammatical faith, one reaches "Lucifer's treasures". The reasoning behind this interpretation is that these rolls were baked in the middle of the year's darkest period (sunrise began at 8:39 a.m. in Stockholm this morning and will be waving goodbye around 2:46 p.m.). Their sunny yellow color (as well as the crossed shape Amata so perfectly demonstrated) was to scare away Lucifer who was otherwise happily hopping around the farm in midwinter's cold and darkness. Is this explanation more reasonable than "Lucia cats"? I dunno. But I do find a little whiff of brimstone in the otherwise bleached-and-starched-whiteness of Lucia especially enticing! 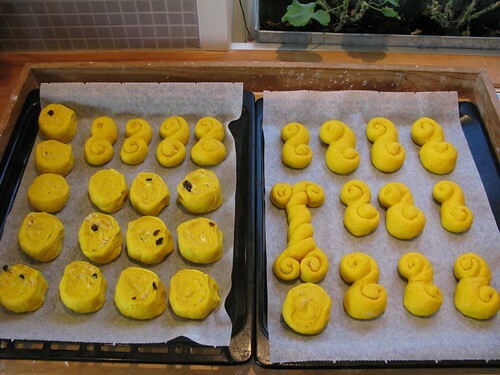 We’ve already made a few batches of Lussebullar (the generic term) this year. Here’s my translation of my wife’s trusty recipe. 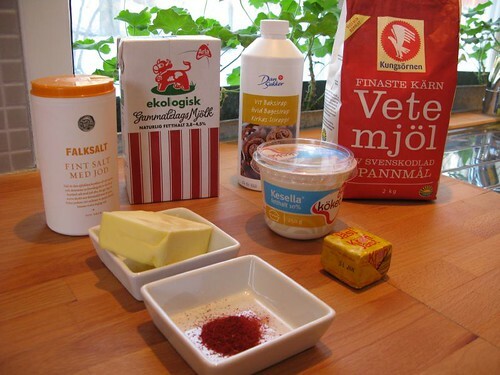 Mascarpone may seem a little exotic for a traditional Swedish recipe. “Kesella” or “quark” is used over here and mascarpone seems to be the closest replacement that I remember being able to find in the States. Pour yeast into a large bowl. 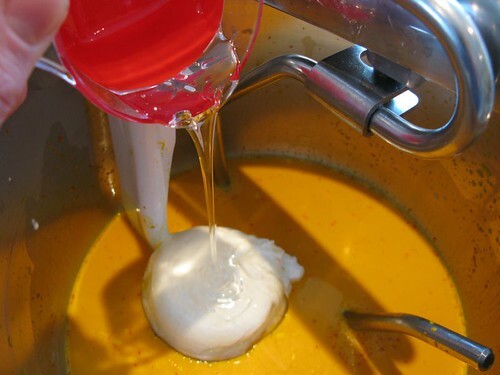 Melt butter(1) in a saucepan or microwave, add milk and heat to body temperature. Pour milk/butter mixture over the yeast and mix to dissolve yeast. 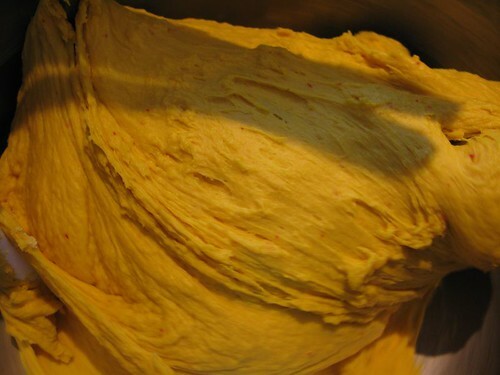 Add mascarpone, saffron(2), sugar, salt and most of the flour. Knead the dough until it is shiny, elastic and not-too sticky (add more flour as needed but not too much! 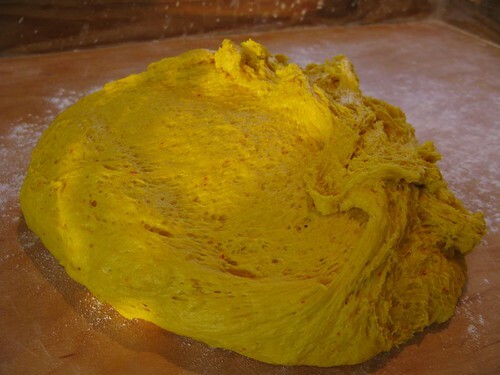 This is a sticky dough…). Let rest/rise for 40 minutes. 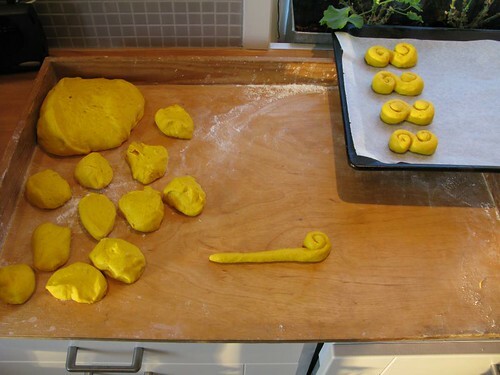 Roll into shapes as desired (this dough is enough for about 35 shapes). Place shapes on a greased cookie sheet (or on parchment). 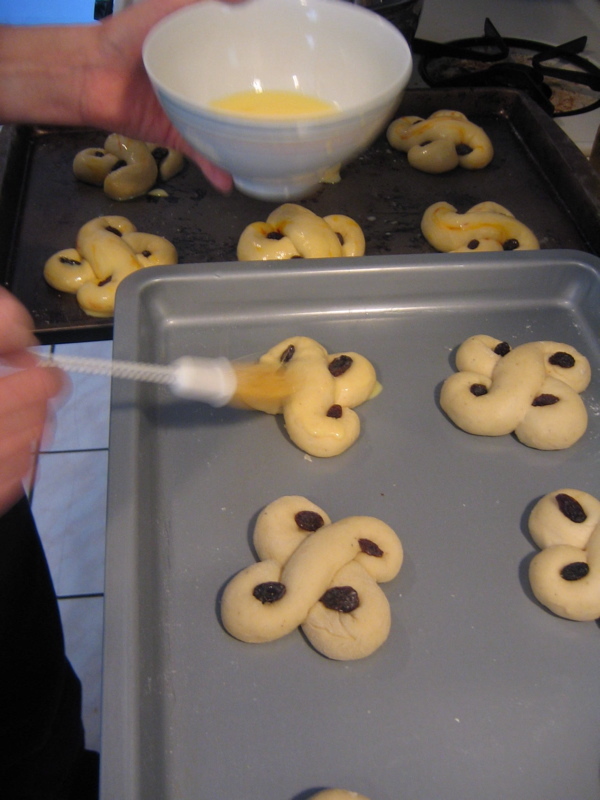 Garnish with raisins and let rise for 30 minutes. Heat oven to 425 degrees. Brush shapes with eggwash and bake for 5-8 minutes (larger figures should be baked at lower temps and for longer times). 1 I’ve read that using non-melted butter makes for a better finished product and have begun doing so myself. If you choose to, just add softened butter along with the mascarpone, etc. 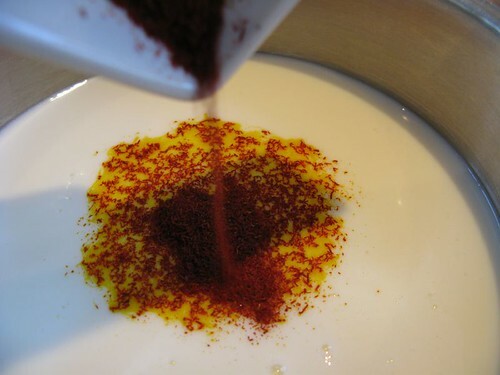 2 Saffron will have a much better/pronounced flavor if it is steeped in the milk overnight over even just added to the melting butter in the previous step. Mascarpone strikes me as sufficiently richer than quark that subsitution of it for the lighter substance would be a somewhat radical change (though conceivably not unwelcome). ... that it is also available in quantity and at a decent price at Hans' Delikatessen Meyer. Bill SF/NM also indicated in the above linked thread that it's fairly easy to make. Normally (and in the basic recipe Bill describes) quark is made from milk but mascarpone from cream. Great tips on the quark, Antonius. The mascarpone is certainly richer but I didn't judge that to be a problem. The addition of quark is not traditional but does make for a soft bun that seems to stay moist for a longer period of time. 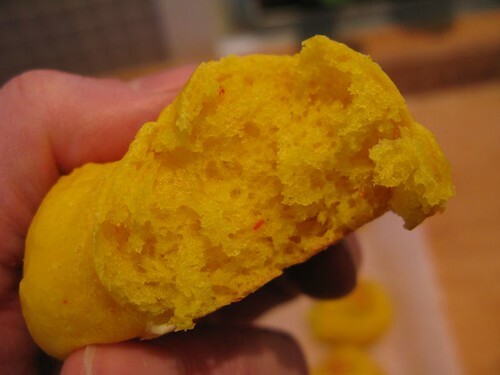 I wasn't that wild about the buns as they came out; saffron seemed to add an odd, almost chemicaly flavor to what's otherwise basically a dinner roll recipe, I'm interested by Bridgestone's comment about steeping it in the milk overnight for better flavor. Or simply using cardamom, as Amata did, which is good too. My rolling technique was not so refined as Amy's, either, though I at least wound up with a decent little S-shape for each one. There's an image to remember when they're teenagers. Mike, thanks for the follow-up. King’s Thursday, that’s a great picture! I am in awe of the Julbord plans of Doug Mose, as posted over here. I'm certainly not doing anything that ambitious for the holidays, but here is another installment. My mom grew up with these cookies, baked by her mother in Minneapolis, and in turn my brother and I grew up with these cookies as an indispensable part of Christmas. Maybe this recipe isn’t authentically Swedish (note the Crisco…) but it has always felt like part of the Swedish holiday baking to us. Hey, in North Carolina we were the only Scandinavians around, so it was hard to tell the difference between ethnic tradition and family eccentricity. My mom always, always made several batches of these cookies at Christmastime – it’s something her friends know her for and ask hopefully if they are going to get “some of those ginger cookies.” So last Christmas it was a big deal when my mom told me on the phone not to expect any cookies during our visit. My dad’s health had been rapidly declining (in fact he went into the part of their retirement community with total nursing care soon after Christmas). My mom, with her own health problems, was near the point of total exhaustion taking care of him at home, and the usual Christmas preparations were more than she could face. The night before we went to NC I stayed up late baking these cookies and brought them on the plane as a surprise for my parents. I think my dad ate about half of them himself, chain-munching. As it turned out, that was my dad’s last Christmas. I know our visit made him happy – and so did the cookies. Mix together the dry ingredients. In a separate bowl, cream the Crisco and sugar, then beat in the egg and molasses. 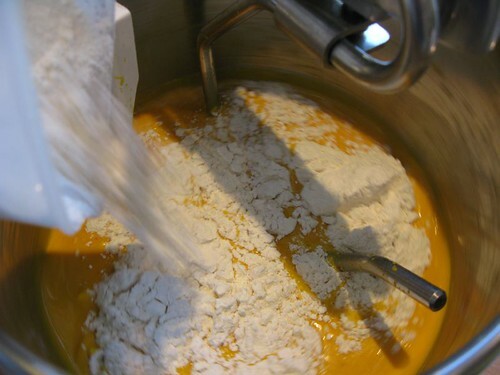 Gradually add the dry ingredients. Chill for at least 1 hour. Bake for 15 minutes. I must admit that, with the oven we have now, my cookies come out flatter and crispier than I want (the oven temperature is unreliable). But flat or not, these cookies taste great. Before putting the cookies in the oven, I flatten them gently with a glass (maybe to about half the thickness of the balls you started with). I then cook them for a little less time -- 10-12 minutes instead. I'm not a very expert baker, but I'm reasoning that if you flatten them a little before you start then you wouldn't need to cook them as long to get them to cookie-shape, and thus they'd get less crispy. I don't know, before now, I never thought before about the reason for the flattening step. Doubtless some of our more experienced and educated bakers know better than I -- maybe it's just that I've started to take my cookies on the early side in desperate hope of properly chewy ginger (or as I think of them, molasses) cookies. Thanks, Joe. I had some leftover batter in the fridge so I tried out your tips this morning -- both the flattening and the shorter bake time. They definitely came out softer/chewier, so thanks! The cookies were still not as tall as I wanted, but it occurred to me that perhaps the culprit here is elderly baking soda. I'll have to try a new batch in a few days. I guess the Christmas bread Julekake is probably more Norwegian and Danish than it is Swedish, so apologies to all Scandinavians reading along for blurring the borders and reporting on this in a Swedish thread. 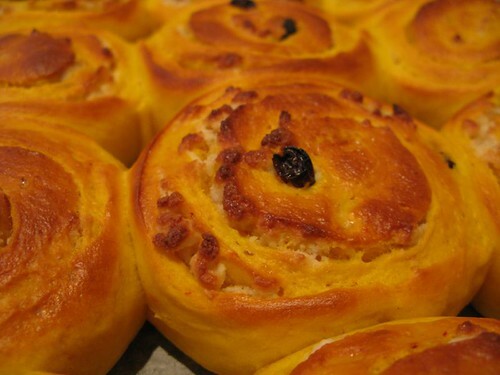 Julekake is a sweet cardamom-flavored yeast bread with raisins and fruits. The way my family makes it, the bread contains a mixture of candied fruits along with the raisins – red and green cherries and yellow citron. That’s also what the recipes I’ve seen call for. But for some reason I couldn’t find those candied fruits at our infernal neighborhood Jewel, so what I decided to use instead was a bag of Sun-Maid Fruit Bits: raisins, golden raisins, dried apricots, dried apples, dried peaches, dried plums, and dried cherries. I liked the bits of dried fruit a lot. To tell you the truth, I’ve always found those bright green cherries a little frightening. I think I might stick with the dried fruit variation in years to come. I make fruitcake every year and I use a little of the red and green cherries (which I did get at Jewel, btw) just because people expect them... but I also use figs, apricots, dates, and the like, and personally prefer what they bring to the cake. It's a short slippery slope from traffic-light-colored candied cherries to baking with M&Ms or something similarly sacrilegious. Let the mixture steep and cool to about 95 degrees. ... and mix to dissolve the yeast. Mix until elastic (about 10 minutes). Let rise for 45 minutes and pour out onto a floured working surface. We like to gild the lily around here (something unheard of by most LTHForum-readers, I'm sure...) so half of the batch was made into buns. 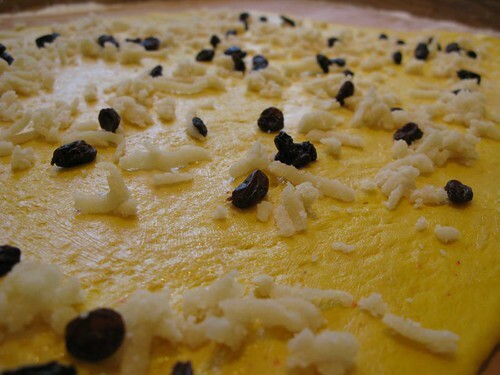 Simply roll out the dough, spread rooms temperature butter on it, grate almond paste over and sprinkle with raisins. Roll up and slice the roll into inch-thick buns. Place all of the buns on buttered or parchment-covered pans and let rise for 30 minutes. Before baking, brush with an egg wash and bake in a very hot (425 degree) oven for 5-10 minutes. Keep an eye on these as they seem to brown in seconds! Wow, Bridgestone, those look beautiful! thank you for the wonderful photos and commentary. 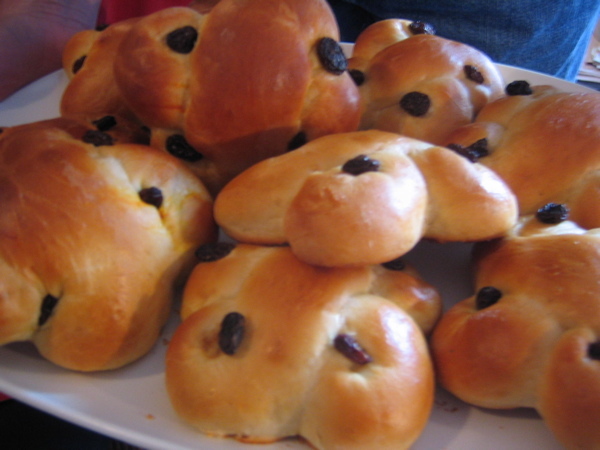 The Lucia buns look beautiful. They appear yellower than other versions I have seen - is that accurate, or is it just the way the colors appear on the screen? Would love to have the recipe. As I just sent a pm to Bridgestone saying I sometimes found it difficult to follow/extract/find the recipe in his posts, I'm glad to see I'm not the only one! In fact, the recipe is there. Here it is in more customary recipe format. 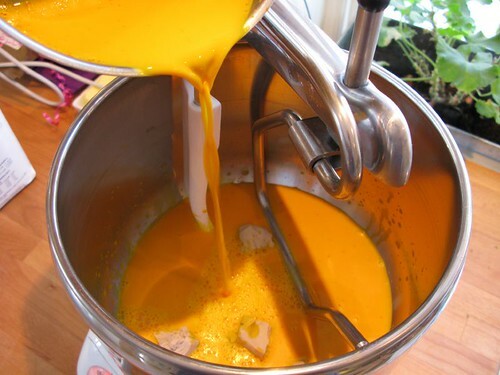 Add the milk/saffron mixture to the yeast in the mixing bowl and mix to dissolve the yeast. When the yeast has dissolved, add the quark and the "baksirap"/sugar before adding the flour. Add the salt and the rooms temperature butter (bit by bit). Add any extra flour needed to make the dough managable and mix for another 10-15 minutes (on low speed). When done, it will be very elastic and slightly sticky. 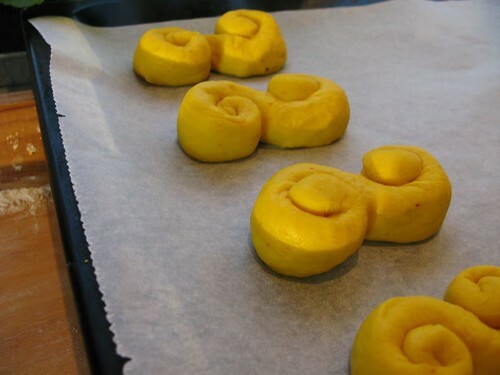 This batch makes about 35 buns so divide into 35 pieces and start making your shapes. 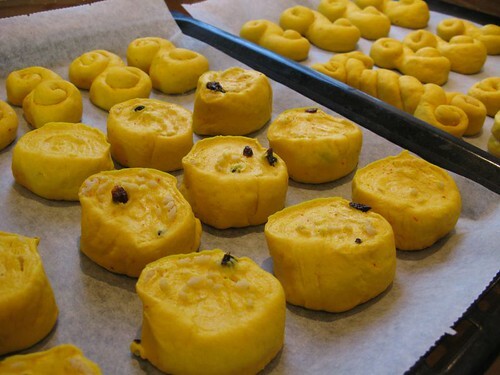 Simply roll out the dough, spread rooms temperature butter on it, grate almond paste over and sprinkle with raisins. 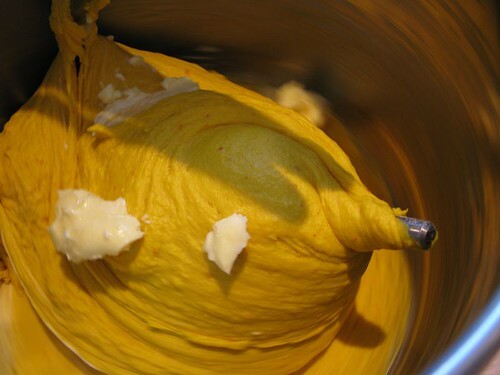 I'm sure it's the saffron that makes the dough so yellow. I too suspect that it is the larger quantity of saffron which accounts for the enhanced yellow color. Now to the bakisrup - any suggestion for obtaining it or, proportions of glucose to sugar to replicate it? O.K. - I get it. I'll try to write my recipes out in more traditional lists. Thanks for your help, LAZ. I put a double amount of saffron in this batch and that accounts for their intense color (and taste!). Baksirup is far from necessary. In fact, most recipies simply call for granulated sugar (including this original version of this one). I found that while the sirup did, in fact, keep the buns more moist for a day or two, they still did get pretty dry. We always end up freezing the entire batch minus enough buns for one or two days. Defrost small refill batches slowly and you'll have a hard time telling them apart from freshly baked. I like your narratives as you prepare your recipe. I would continue that style, because it just is you. Maybe in a follow up post or at the tail end or the original post, provide the recipe in a classic style. Always a treat to read your posts. Thanks for the response on my earlier questions. In my opinion, a post is not always about the actual recipe, but about evoking a response in the reader. Your posts, with their accompanying pictures do just that. So, please stick with your current reporting style which is very enjoyable. Cathy2 wrote: Maybe in a follow up post or at the tail end or the original post, provide the recipe in a classic style. Yes, this would be the clearest way to do it. I love the pictures and narratives, too, but while a recipe for others to follow may not be the point of a post, it seems an awful shame to go to the trouble of providing one and then not have readers notice it is there!